Central reserve police force of India has invited online application for various posts and the last date to apply is 5th may 2017. These invited Application for various posts of SI, ASI, Mason, Plumber, Electrician, Carpenter and Painter is only for male candidates of India. Details about Education Qualification, fee, selection process and all details given below. CRPF is short name for biggest central armed police force of India known as Central reserve force of India. It became CRPF in year 1949. 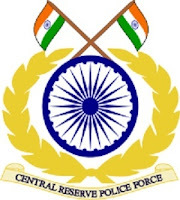 CRPF is governed by central home affairs of India.Child agencies of CRPF are CoBRA and RAF. Minister responsible for work of CRPF is Rajnath Singh (Home minister of India). * 18 – 23 years for Post CT/ Mason,CT/ Plumber,CT/ Electrician, CT/ Carpenter ,Painter as on 05-05-2017. Age relaxation is applicable as per rules given in official notification below. Candidates those who want to apply for the various posts of CRPF should have following education qualification. Intermediate with 3 years Diploma in Civil Engineering from a recognized Board/Institution or university or equivalent. Minimum matriculation / 10th class pass or equivalent from a recognized Board, or university recognized by the Central or State Govt with One year experience in respective trades i.e. Massonry, Carpentry, Painting, Plumbing or Electrician, certificate (Three months & above duration) under National skill qualification framework compliant anchored by National skill development Agency (NSDA) under Government of India, Ministry of Skill Development and Entrepreneurship or certificate of trade from recognized Industrial Training Institute agency. Candidates needs to pay by online payment according to different categories given below. No fee for SC, ST, ex servicemen etc. Candidates will be selected based on PST/PET & documentation, Written Exam, Medical Exam, Drawal of Merit List. Candidates will be selected on basis of PST/PET & documentation, Written Exam, Trade Test, Medical Exam, Drawal of Merit List. Candidates have to apply online before last date 05-05-2017.